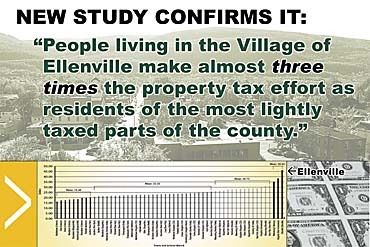 A recent report of the divisions of Ulster County's tax burdens found that residents of the Village of Ellenville pay three times the level of "tax effort" than residents of the most lightly taxed parts of the county. The recently published report, "Equity and the Property Tax Burden for Citizens in Ulster County," examined the widely different levels of taxes incurred by properties of similar values in different parts of Ulster County, and was created by the Center for Research, Regional Education, and Outreach at SUNY New Paltz. In general, Ellenville property owners pay twice as much as others in the county. "Tax Effort" translates to the aggregated levy divided by $1,000. We spoke to Gerald Benjamin, Associate Vice President for Regional Engagement and Director of the Center for Research, Regional Education and Outreach (CRREO) at SUNY New Paltz about the background to the report, as well as the creation of the County Charter. Tax Effort: The ratio of tax collections to "tax capacity." In the case of property tax, the "tax effort" can be thought of as the percentage of property value that is paid in taxes each year. In Ellenville, for every $1000 of property value a resident pays over $45 in property taxes per year. Marbletown, by comparison, pays around $15/year for every $1000 in market value. Full Value Per Pupil: The amount of Real Property market rate "Value" per pupil in the school district. In Ellenville's case, the full value tax base for the district is $897,790,940. The district has 1,743 pupils, so the "Full Value Per Pupil" is roughly $897,790,940 / 1,743 = $515,000 per pupil. Joined New Paltz faculty in 1968 as an Assistant Professor in Political Science. Benjamin was an elected member of the Ulster County Legislature between 1981 and 1993. He was Majority Leader from 1985-91 and Chairman from 1991 to 1993. At SUNY, he served as Chair of the Department of Political Science, Presiding Officer of the faculty and (for twelve years beginning in 1996) Dean of the College of Liberal Arts and Sciences. In 2004 the county legislature appointed him to chair the Ulster County Charter Commission. The county's first charter will go into effect in January 2009. Benjamin explained the reasons why the county's 55 distinct, but often overlapping, tax authorities are so fragmented. "Well, it's not exceptional. Local government in the state of New York is a very layered system. What happened is that in New England, the towns prevailed over the counties as the dominant local government structures. In the southern states, it was the counties that won out. The mid-Atlantic states, New York, New Jersey, Pennsylvania wound up with a combination of the two. The bottom line is that as time went by, very little was abolished; there was very little subtraction of these layers of government. Indeed, New York City's consolidation in 1898 was the great exception to the rule." Thus, the state is left with a wealth of little taxing districts with wildly different tax rates. So, it turns out that to live in one the county's three villages � Saugerties, New Paltz, or Ellenville � is extremely expensive. Villagers in New Paltz pay 22.8% more property tax than do people who live in the town of New Paltz and are in the New Paltz School District. Those who live in the Village of Saugerties pay 24.9% more than their neighbors in the town who are in the Saugerties School District. And those in the village of Ellenville pay a whopping 47.8% more than people in Wawarsing, who are within the Ellenville School District. The CRREO report says that someone with a house worth $260,000 living in the Village of New Paltz would pay $1,497 more in property taxes than someone with a house in the Town of New Paltz. In Saugerties the difference would be $1,495. And in the Village of Ellenville? $3,876, more than twice as much of a difference than the other villages as compared with the towns in which they lie. The report also notes that "villages are the only general purpose governments in New York that are created and may be abolished by local choice." About fifty years ago, the three villages and the City of Kingston were not only the most populous but also the wealthiest parts of the county. However, they all began losing population around 1960. The rise of SUNY New Paltz reversed that trend in New Paltz, but since SUNY property is tax-exempt, all four of these four jurisdictions are struggling to make ends meet today. Interestingly, the four jurisdictions with the most tax-exempt property within their boundaries include Kingston, New Paltz, Wawarsing, and Saugerties, plus the Town of Shawangunk, this last one having two large prisons. Wawarsing does too, of course, though these do not lie within the borders of the Village of Ellenville. The lowest tax burdens in Ulster County are found in the Onteora and Margaretville school districts. Onteora has the largest per-pupil full value property tax base in the county. Margaretville ranks second, and both of these districts contain large New York City watershed properties. Onteora � which includes part of Marbletown � had the highest spending per pupil of any Ulster County school district: $19,060 in 2006. Interestingly, the Ellenville School District comes second, spending $18,670 per pupil. However, Onteora's "Full Value Per Pupil" is $1,432,235, whereas Ellenville can only muster $515,083. Were Ellenville, or any of the other hard pressed school districts to spend in proportion to their Full Value Per Pupil in the same ratio that Onteora can (because of the NYC reservoirs), ECSD's schools would probably lack either roofs or teachers, perhaps both. So what might be done about this? Sharing the wealth is one idea being explored. Some or all of the county's money could be pooled and then spent where needed. Another idea that is being discussed by lawmakers is a "circuit breaker" measure that links tax bills to a homeowner's ability to pay them. And, of course, there remains the controversial topic of local politics of a fair property revaluation, more commonly referred to as a "re-val." The State Office of Real Property Services could make sure that property is assessed on the same basis across the county. Gerald Benjamin notes, "Fairness is what is needed here. Measures need to be taken to ensure that." Next Issue: Local officials discuss the problem. Copyright © 2008, Electric Valley Media Corp.